Seawater Greenhouses are designed to help relieve the burden of food scarcity in areas that are dry and lack access to freshwater. Currently found in such areas as Tenerife, Qatar, Abu Dhabi, Oman, and Australia, the greenhouses use an evaporator and “prevailing winds” to distribute humid, freshwater air to plants for absorption. This project has been a long time coming; the pilot project began in Tenerife in 1992, with the next built in Abu Dhabi in 2000. The product website cites climate change, the rising world population, and unsustainable farming practices as reasons to find a way to grow food in areas previously thought to be inadequate. A way to grow food in areas of the world where fresh water is not readily available is not just essential because it increases affordability of fresh produce, reduces green house gases created through long-distance food transportation, but also helps prevent water and food-based conflicts in these regions. Large areas of the planet are not conducive to growing food, whether it be because of high temperatures or a lack of fresh water. the desalination process, which overly stresses the plants with excessive transpiration (i.e. the evaporation of water from plant leaves). Areas downwind from the greenhouses also benefit from the fresh-water laden air. Greenhouses provide heat absorption and water evaporation to the surrounding area, acting much like a forest in areas where they are densely populated. Unfortunately, these greenhouses don’t come cheap, and aren’t something that a small NGO or group of farmers could feasibly purchase and construct without serious financial backing from investors. 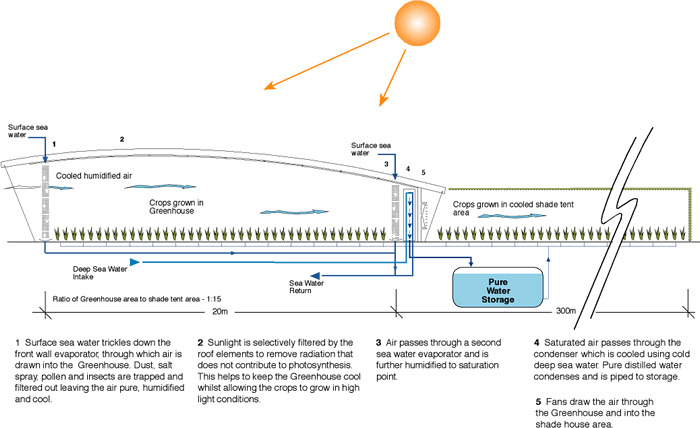 Once constructed, however, the greenhouse would potentially provide a 15-35% higher return than conventional greenhouses. Additionally, the overall operating costs are greatly reduced, because the greenhouses don’t rely on expensive equipment for heating, cooling, CO2 enrichment and desalination. Sources: The Empowering People Network and Seawater Greenhouses. Photos courtesy of The Green Prophet and Sally Dominguez. Abu Dhabi, Agriculture, climate change, Food, Middle East, seawater greenhouse, Water. Bookmark.